The members of the Southern Maine Workers’ Center believe that working class and poor people must organize together in order to transform our workplaces and communities. We are a member led and member powered organization. This means that our members plan and carry out all of our committee work. Click here to learn more about becoming a member. Too many people in our communities either go without the health care they need or are burdened by medical debt. This is why we’re committed to building the collective power of people across the state to win a universal, publicly funded health care system in Maine. Many of us don’t know about our legal rights in the workplace, or how to organize to ensure that our legal rights and our human right are met. Our WWD Committee is focused on building the knowledge, skills, and unity of low wage and unorganized workers across a range of industries to organize for justice in our workplaces. Every year at our Annual Meeting, Southern Maine Workers’ Center members elect our Board of Directors. Click here to meet our elected board members and committee chairs. Your donations do more than keep our doors open and our lights on (which they do), they also help us remain independent and accountable to our members. Please make a donation today to support grassroots organizing for racial and economic justice in Maine. 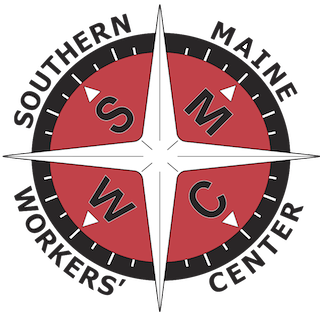 The Southern Maine Workers’ Center (SMWC) is a member-based organization comprised of working and poor people building grassroots movements to ensure that our of all of our basic human rights are met.